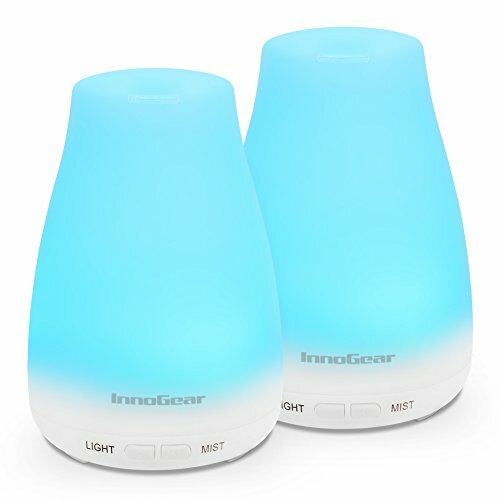 InnoGear upgraded 150ml oil diffuser, mist can lasts much longer than before. Making your home smell better with advanced ultrasonic vaporizing diffusion technology, it quietly releases a soothing fragrant mist. The humidifier function adds moisture to the air to help you sleep better, cough less and alleviate dry sinuses. 3. Don't exceed the Max line when filling water. 4. Don't overuse the diffuser over 24 hours. Reuse it after 1-hour rest. Otherwise, it might cause adaptor stop working shortly. If happen, try to replug it. 2 Independent Packages Included: Order 2 diffusers for different rooms, or send it as a gift to your beloved ones. Upgraded 150ml capacity, mist lasts much longer. Oil diffuser fills your space with a lovely fragrance that can lift the mood and relieve stress from stressful and tired day, perfect for masking stubborn smoking and pet odors. Whisper-Quiet and Auto Shuts off - humidify your living space to prevent dry, stuffy air and flu/cold germs infecting your loved ones, enjoying lovely fragrance and benefit from aromatherapy healing.